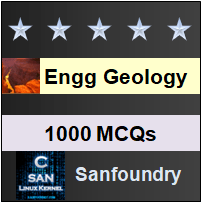 This set of Engineering Geology Multiple Choice Questions & Answers (MCQs) focuses on “Classification of Faults – 03”. Explanation: When a series of thrust faults occur in close proximity, thrust blocks are piled up one above another and all the fault surfaces dip in same direction. The resulting interesting structure is known as an imbricate structure. 2. In the Himalayan Mountains, many well defined nappe zones have been recognized. State true or false. Explanation: In the Himalayan Mountains, many well defined nappe zones have been recognized among which may be mentioned the Kashmir Nappe, the Nappe zone of Shimla Himalayas and the Nappes of the Garhwal Himalayas. Explanation: There are some other terms used for strike slip faults such as lateral faults, transverse faults, wrench faults and transform faults. Of these, the transform faults are very common and denote strike slip faults specially developed in oceanic ridges. Explanation: Strike-slip faults are defined as the faults in which faulted blocks have been moved against each other in an essentially horizontal direction. The fault plane is almost vertical and net slip may be measured in great distances. 5. Which fault is developed in oceanic ridges? Explanation: The transform faults are very common and denote strike slip faults specially developed in oceanic ridges. 6. San Andres fault is the best example of which type of fault? Explanation: The best example of a strike-slip fault is the great San Andres fault of California. It extends for almost about 1000 km in a NW-SE direction. 7. Identify the type of fault from the figure below. Explanation: From the figure it is clear that the hanging wall has moved up with respect to the foot wall and hence clearly it is a reverse fault. 8. If the left block appears to have moved towards the observer, then which type of fault does it belong to? Explanation: Strike-slip faults are further distinguished into right handed or left handed depending on the direction of movement of the block with respect to an observer: it is a left-handed fault if the left block appears to have moved towards the observer and a right handed fault if the right block seems to have moved towards the observer. 9. What are pivotal faults called as? Explanation: Hinge faults are also called as pivotal or rotational faults. A hinge fault is characterised by a movement of the disrupted blocks along a medial point called the hinge point. Explanation: The movement in hinge fault, is rotational rather translational. 11. Which is the rare type of fault? Explanation: In hinge faults, the amount of displacement increases away from the hinge point. These are rather rare type of faults. 12. What is the displacement range of strata in San Andres fault? Explanation: The strata is believed to have suffered displacement varying between 50 km to 200 km in the San Andres fault in California.